One of the leading ways to make a good impression with potential clients is to use professionally designed business cards. It is also an effective tool to promote your business using these professional designed and made business cards. A high quality business card tells others a lot about you and your business. 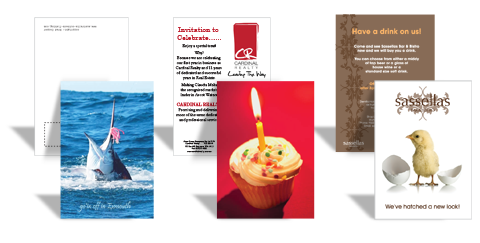 The professional and dedicated WA PRITNING team in Perth and Midland, will design and print you a completely new business card or alternatively re-create your existing business cards, combining existing logos and graphics. You can always be sure the final product will be of high quality. 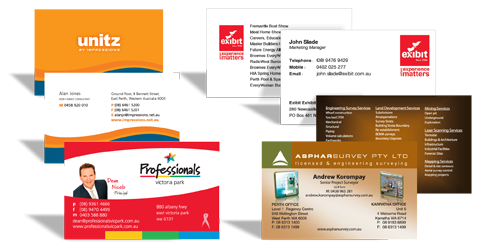 At WA PRINTING, we provide business cards printing in full color with high quality for 350 gsm. Business cards are also available in a wide range of styles, to meet your needs and budget. Standard Size for business cards in Perth is 89mm x 54m (Plus 3mm on each side), but we can print to any size you want, depending on your request, please place a order or quote to obtain pricing on special sized business cards. For added impact, we offer special foil or high-gloss UV coated business cards, providing a thick layer of durability to make your business card last longer and stand the test of time. For the environmentally conscious we currently, we have 100% recycled 300gsm paper in stock.